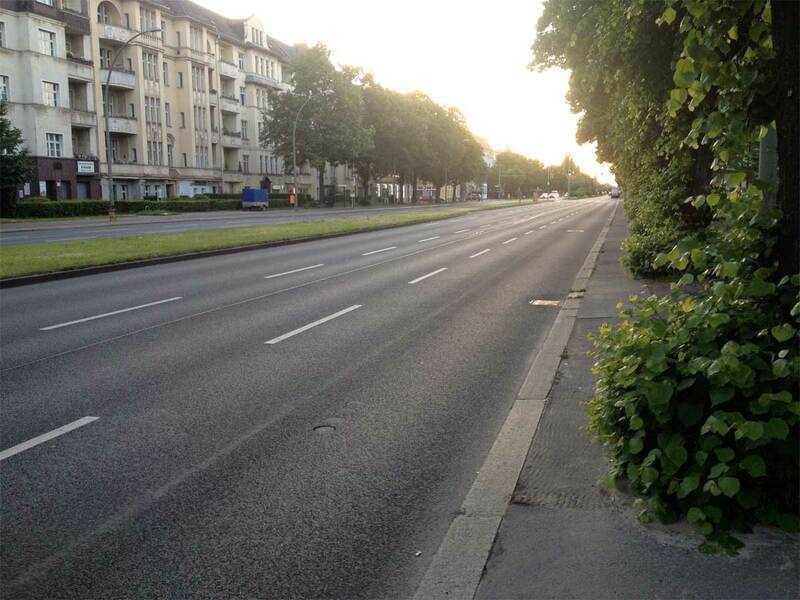 Interesting post given that just last week I did some research on cycling in Berlin after someone posted in a thread about how well-behaved cyclists appeared to be there, based on what sounded like a short visit with limited observation opportunities. I’d heard before about how Berlin was apparently a mecca for cycling, but despite its miles of available infrastructure, conditions there are little better than that on offer across the UK, depending as they do largely on botched shared use with pedestrians and offering little advantage over motor vehicle transport. – having said that, people on bikes in Berlin *do* break the rules, and from what I understand rule breaking is quite common there: in April 2010 (only figures I can find) Berlin police fined 4,114 cyclists during an intensive two week period, including cycling on the pavement/in a pedestrian zone (907 cyclists), cycling the wrong way up a cycle path (457), running red lights (1,793), riding unsafe or defective bikes (1,083) and four people were fined for riding fixies with no brakes, lights or bells. 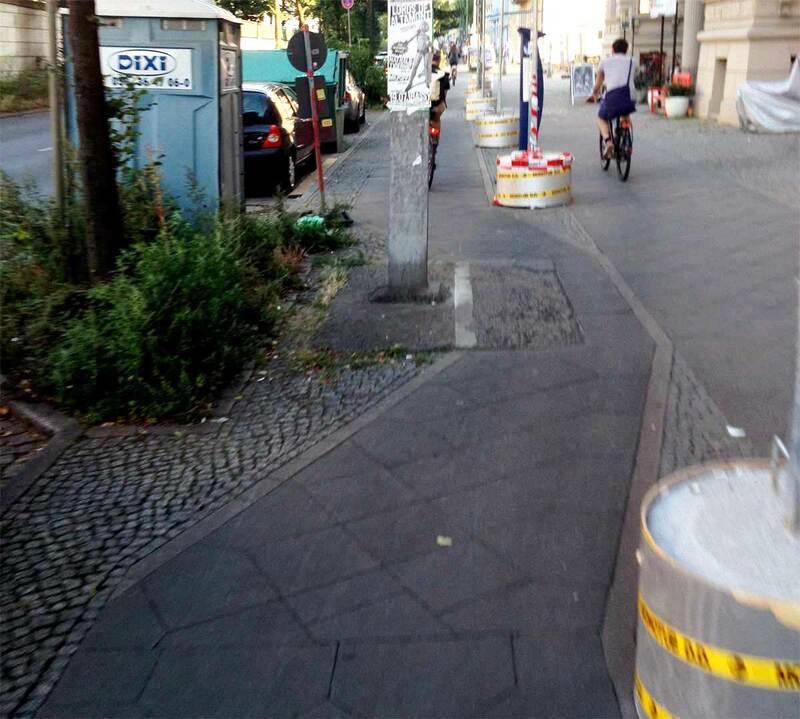 – there are still problems for people on bikes in Berlin. Fifteen cyclists died in 2012, seven of them through collisions with lorries; and 4,533 more were injured over the same period. I guess my main point in replying was that with all the miles of infrastructure supposedly dedicated for cycling on, it’s of such poor quality that people on bikes in Berlin are just as likely to break rules – I’d guess out of a sense of frustration – as we are in the UK. Thanks for sending what you found. I won’t go on about it too much here, as I’ve got more posts planned, but you’re right in saying that the poor quality of the cycleways encourages rule-breaking. Footway cycling is common, and largely tolerated as far as I can tell. Like in the UK, the authorities are quite happy to push cycling onto the footway when it suits them, either with a white line or a shared path, and then act surprised when people cycle on the footway elsewhere. But then, parking on the footway and cycleway are both common too – people don’t just break rules when they’re riding a bike! This idea of the Germans being sticklers for rules is absolute nonsense. Maybe down south they are, I don’t know, but not in Berlin, that’s for sure! I don’t think there are many shared use footways (not that I’ve seen, anyway) though it’s not unheard of either. I’m not sure where that 100km of shared use statistic comes from! Generally, people cycling are expected use a narrow, badly-maintained cycleway one minute, then be perfectly happy “sharing” with buses and lorries the next. Despite all the flaws, it is much better, and easier, to ride a bike here than in the UK. But then, that’s not difficult, is it? Can’t remember now precisely where I saw the phrase but as you say, and looking at the police data breakdown, it does appear to be a fallacy. That from Wikipedia (cycling in Berlin, I think), so I suppose it should be read with a certain amount of scepticism. Nothing should come from Wikipedia. Following the footnotes on that claim goes to a broken link on a Senate department website (guess they’ve not read Cool URIs Don’t Change) and browsing the website lead to http://www.stadtentwicklung.berlin.de/verkehr/politik_planung/zahlen_fakten/entwicklung/de/fuss_fahrrad.shtml but I think that number doesn’t appear there. It’s good to see that a change of scene hasn’t lowered your hackles. Let me know when you finally move to NL. It is fine to point out tons of technical details. But you forget to look at the bigger picture, dear author. There are two essential points you entirely forgot with all your detailed technical descriptions of bad cycling tracks ( and not all are like the examples you pointed out). Firstly: the mentality. While in Leeds or Northern England where I unfortunately have to live people just ignore regularly the rights of cyclists, dont take them seriously, supported by an inefficient police, in Germany most of the car drivers are aware of cyclists. It is taught in driving lessons to turn right with the head to see, if a cyclist overtakes from the right, before a driver can actually turn right (imagine this in England all with the left side). So, appearing to car drivers in a blind spot is NOT as dangerous as in the UK where you find – pardon my french – lots of car driver idiots on the roads. Secondly: Unlike Leeds, where even if you have in the middle of nowhere a flat tyre, bus drivers mercilessly refuse to take you along with your broken down cycle; in Berlin, you can use any means of public transport WITH the cycle. For little money, or even for free. Busses, S-Bahn, Trains, Underground. Just take your cycle and jump in. Because no one wants to cycle from Wannsee to Prenzlauer Berg – you just take the S1 – and thats it! Britain has a lot to learn, and educating car drivers is only one step. Ridiculous statements like the one of the city council member in Birmingham that cycling schemes only benefits white young men because old people consider it too dangerous to cylce and women would not cycle if they dress modestly are never heard of in continental Europe. Britain’s mentality needs to change. Good luck with that. I haven’t forgotten to mention those points. As I said in the very first paragraph, there’s far too much to fit into one article, and I intend to cover more later, including the points you’ve raised. 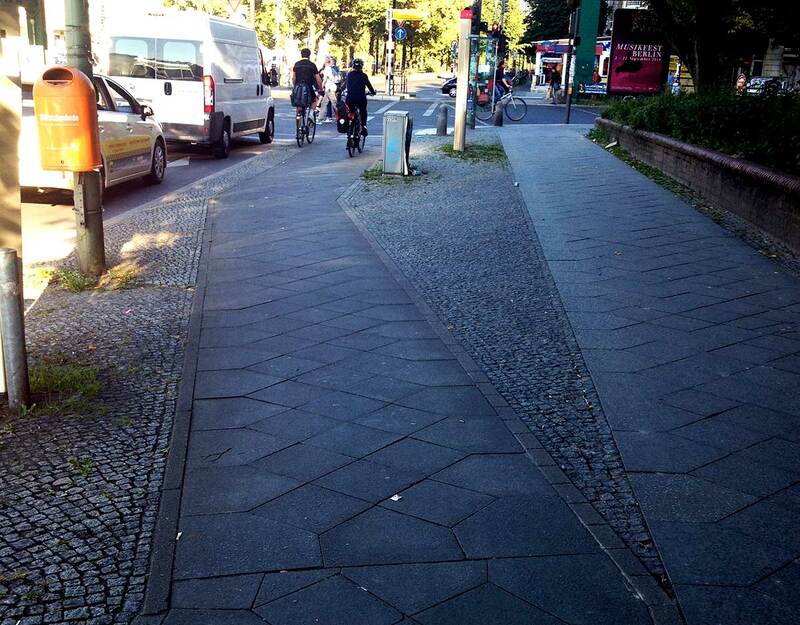 The cycleways in Berlin are mostly pretty bad. I can think of a few exceptions, but not many, and even those are just short stretches of good stuff surrounded by bad. I don’t feel that the photos above have been particularly cherry-picked. On the contrary, I had a problem narrowing the photographs down! 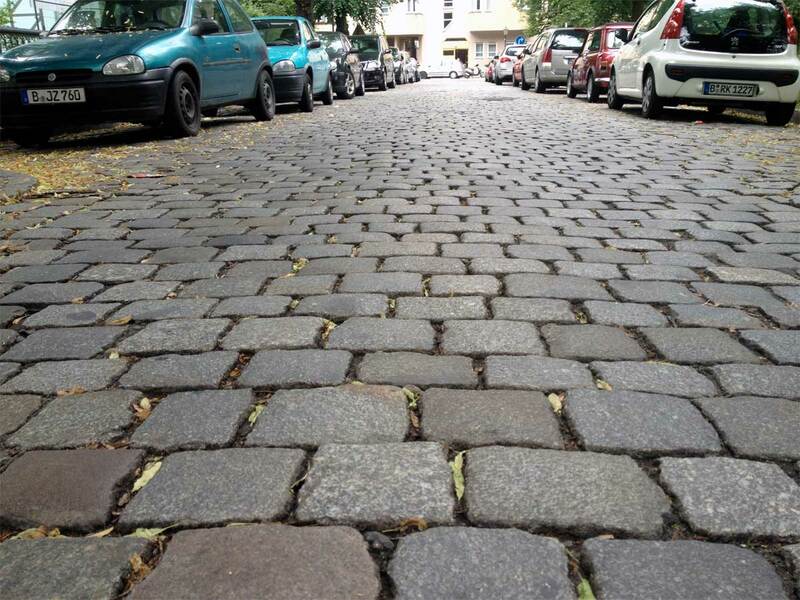 If you know of some truly great cycleways in Berlin, please tell me the location and I’ll go take a look. It’s true that the standard of driving feels better here compared to Britain. Cycling is something that most people do at least occasionally, so it’s not an unusual activity, and the aggressive “cyclist hatred” mentality that’s common in Britain doesn’t seem to exist here. But people are still people. They drive too fast when they’re late. They use their mobile phone while driving. They stop in bike lanes to nip into shops. And I don’t want to ride a bike on a road with buses and HGVs, no matter how well-driven they are. While most drivers do indeed stop to look back when turning, enough don’t that I’ve learned to hang back when approaching a junction, and expect the driver just to turn across me. It’s saved me from being hit more than a few times. It does of course help that the “those turning should give way to those going straight on” rule is firmly embedded here, and drivers get a green light at the same time as people walking, so when driving (or cycling) you know you do have to slow down and give way to people crossing. But relying on fallible human beings not to make mistakes is no substitute for sustainable safety. You do have to – to coin a phrase – “keep your wits about you” for less-than-careful drivers and riders. There’s not much room for error here. While it is indeed handy to be able to take your bike on the S- and U-Bahn, it’s a nice side benefit, rather than a mass transport solution. There are restrictions on the number of bikes trains can carry (though of course people flout this) and it’s not free, either – it costs €1.70 for a single ticket, or €4.70 for a day ticket, in addition to the usual fare. Cycling in Berlin is far, far better than cycling in Leeds (my home for 30 years, incidentally), I love living here. But nor is it anywhere near as good as it should be, or could be, and I’m not going to gloss over that. Learner drivers in the UK are also taught to watch carefully for cyclists, walkers, horses and so on, but once they’ve got their full licence, it’s not really policed at the moment and road design encourages “might is right” abuses by non professional drivers. The foxes are in the henhouse, the farmer is Missing In Action and head henhouse builder Mr Pickles is cheering on the foxes. Good point on public transport. I’ve got a second hand folding bike because that isn’t banned yet – except by Stagecoach’s buses – but that’s not a good solution in general and it’s only a matter of time if things don’t change. Is the patchy cycle path not used by bicycles because its overgown with foliage, or overgrown with foliage because it is not used by bicycles? How would you test either theory? Having ridden along very well-used cycleways with overgrowing foliage, I’d say that people on bikes tend to avoid it. It’s easier to cycle around it than it is to let the stuff hit you in the face or shins, so it continues to grow ever more across the cycleway. Of course, the opposite happens where there are motor vehicles, which constantly trim away any stray branches, as anybody who has ridden on the top deck of a bus will know! It’s over a decade since I lived in Berlin, so my personal memories are neither here nor there. But I think that there are some mitigating circumstances which are worth mentioning. I will accept “excuses” from Berlin (up to a point, and for a limited period of time) that I would find risible if they were to be offered from officials in somewhere like Munich that is much wealthier, hasn’t had Berlin’s problems to deal with, and yet doesn’t seem to be doing substantially better. 1. The public transport network in the city had to be reassembled from its two utterly disconnected halves and connected to its rural hinterland. 2. The city had to cope with a lot of people who had been confined within West Berlin for decaces moving to the country (maybe not ideal in planning terms, but you can only impose so much planning dictatorship on people who have already had the Cold War dictating their movements for decades). Now, as a cycle campaigning type, I don’t believe that any of those things should have been allowed to push cycling nearly as far down the agenda as they did, so that Berlin is really only getting to cycling now and hasn’t achieved all that much yet. But I can completely understand why those in charge were a bit distracted. There is a lecture here, in English, by Burkhard Horn of the City of Berlin Senate Department for Urban Development and the Environment. I think it’s interesting, and it sheds more light on some of the above. Thanks for your comment, very interesting. Especially the police article, I think that might be worth a blog post in itself! Thanks for the comment. 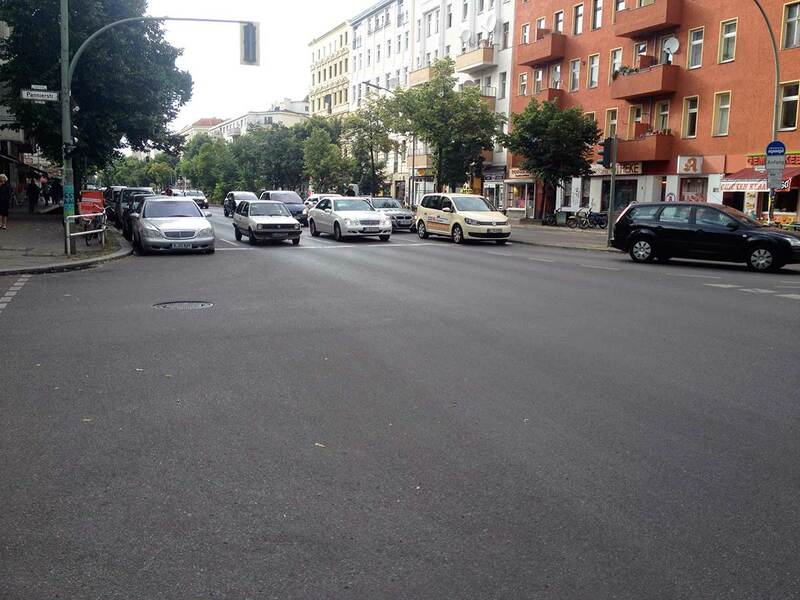 I’m realising that Berlin is pretty normal for German cycling infrastructure. I’m visiting Bremen later this year, so I’ll take a look there too. 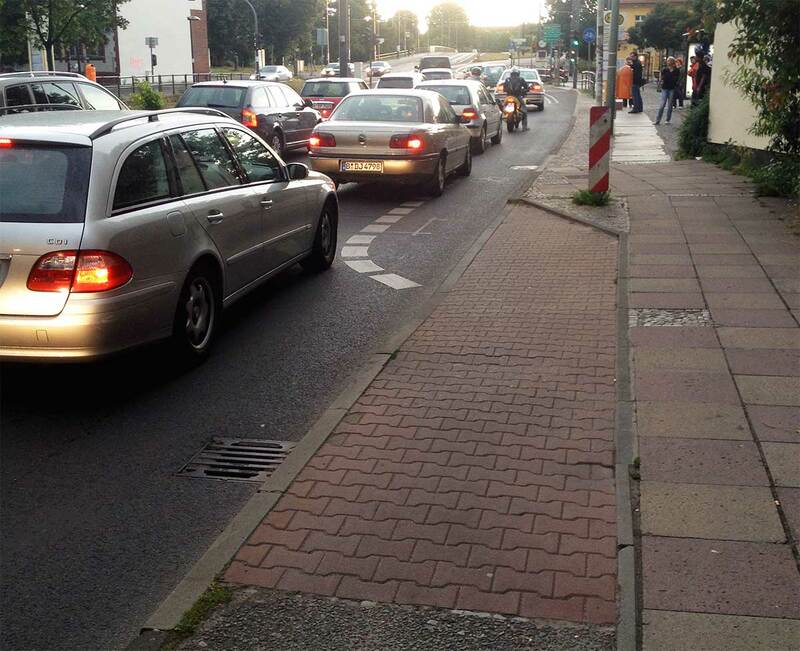 I think Germany needs minimum standards for cycleway design, set at a national level.